The anticipation for Episode 2 of Hard Knocks: Training Camp with the L.A. Rams only thickened in the throes of a report this week that contract extensions for head coach Jeff Fisher and G.M. Les Snead are on the horizon. Finally a Fisher longevity theory that makes sense: Agree to not only do Hard Knocks, but feign anger and crush some would be NFL player’s soul a minimum of four times per episode and be rewarded. Shockingly that theory was left to simmer this week because the Rams and their omnipresent sun had a fake football game to play in front of 90,000 of their closest friends, a few of whom dressed up as Cowboys fans. We all have passion points, and Jeff Fisher’s is clearly respecting the National Anthem. It made a lot of sense when Fisher told players the anthem is “an opportunity to recognize how lucky you are.” Can he please write an anthem etiquette guide for fans while he’s at it? Defensive line coach Mike Waufle has a fascinating personality spectrum. How can the same man who riffs off at least four f-bombs during 60 seconds of open practice footage, later sheepishly tell his lineman “you’re not tough enough mentally” in the most polite fashion possible during a film session? It was an underrated moment when Todd Gurley told ESPN’s broadcasting crew that he cried upon founding out he was named to Pro Bowl. 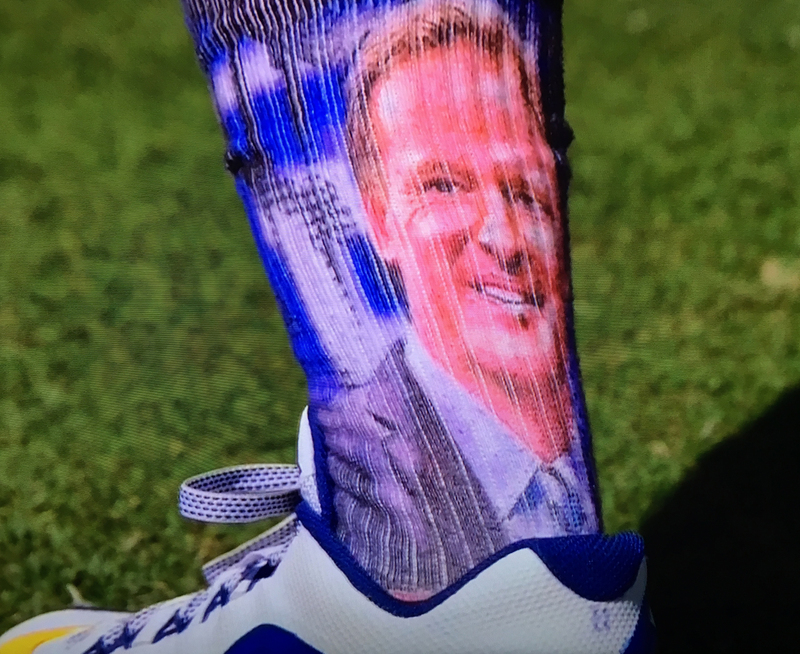 Tavon Austin made quite the statement wearing a sock with a silkscreened image of Roger Goodell. A poor job by the Hard Knocks crew not to let us know why Austin was wearing a Goodell sock. He possibly mumbled his rationale but the audio was incomprehensible. So yeah, that one was just left hanging. Cute kid of the week award goes to the Rielyn, daughter of newly signed WR Austin Hill (whose father, David, played for the previous carnation of the L.A. Rams). Rielyn’s age was not revealed but guessing tree rings, she has to be somewhere in the 4-6 year old range. So given that she is closer to 4 than 24, it was adorable when, after some prodding by her mom, she admitted to being cute. But Rielyn was off the charts adorable as she answered her mom’s (not at all submitted by the Hard Knocks producers) question about the thing she’s most excited for. “My daddy catching a football.” Ahhh, and go Austin! “Los Angeles Rams Locker Room” contains a disproportionate amount of “Ls” and “Rs” for a sign. Junior Seau’s nephew, Ian Seau, is a Rams rookie and spitting image of his late uncle. Coach Waufle was impressed with Seau’s get off, and Snead chatted him up to Jon Gruden but he feels mostly like a long shot. Perhaps it’s Ian’s resemblance to Junior or the constantly swelling concussion/CTE storylines, but all I pondered during Ian’s clip was how the Seau family business can stay status quo after what happened to Junior. Tackling dummy robots are the coolest thing ever, and I could easily see them developing into the next fitness class craze. In the meantime, can any of them play left tackle? The Rams look quite good when they play against each other. Yellingest coach of the week: Offensive coordinator Rob Boras who unloaded on his players during halftime of the preseason game. If Boras said 100 words, 99 of them were four letters. In closing, a mostly fun, albeit uneventful episode. Rielyn didn’t get to see her dad play, and we didn’t get to see any significant camp battles. But tackle dummy robots, dinosaur conspiracy theories and f-bombs can compensate for anything.